Kate Sheppard is reporting this week from Vietnam, where she’s learning how the country is already adapting to climate change. To read her first dispatch—from a farm where one family is planting a new type of watermelons designed to withstand weird weather caused by global warming—click here. Her second dispatch, about too much salt in the Mekong Delta, is here. Hanoi is easily among the world’s most polluted cities. Some experts even think it’s the worst in Southeast Asia, but there are plenty of others that provide stiff competition. It’s apparent even as you approach the city, since the urban skyline is obscured by a heavy haze. Before coming here, I’d heard I would never see the sun in Hanoi. That has proven not to be much of an exaggeration. But unlike in US cities, the nasty air here isn’t from a fleet of cars. 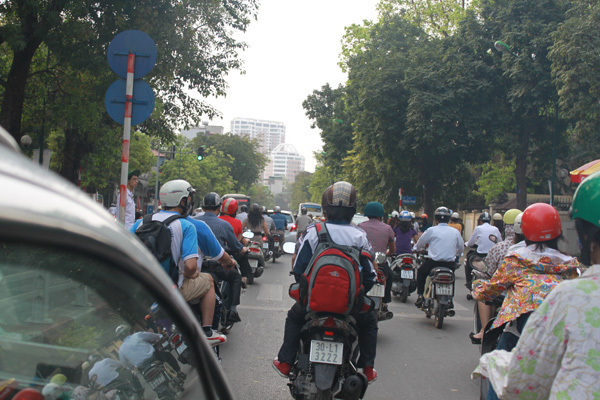 It’s from all the motorbikes and mopeds, which number at least 1.8 million in Hanoi. (That estimate is from 2008, however, and is likely far too low now given that the population has since swelled to 7 million.) Nationwide, there are about 20 million on the roads, buzzing and zigzagging along. 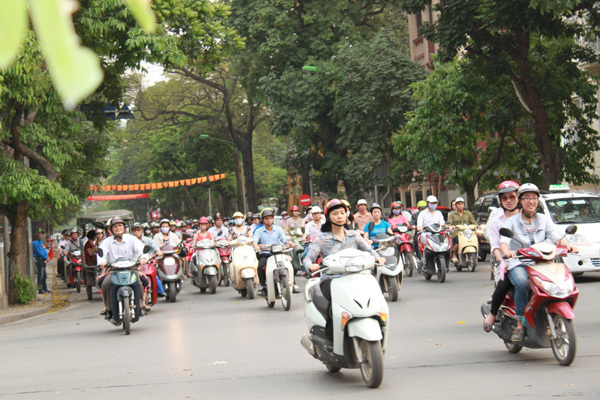 The streets of Hanoi are a free-for-all of two-wheeled transit. Divider lines are treated more like suggestions than commands, and crossing the street on foot is only for the brazen. I’ve seen people texting, chatting on the phone, smoking, eating, even reading as they zip past. They carry panes of glass, giant ice cubes, impossibly large loads of rice and beer. On Sunday, I saw a guy carrying another motorcycle on the back of his motorcycle. Parents stow toddlers between them, sometimes fitting an entire nuclear family on one bike. Many motorcyclists don full-coverage face masks to block out at least the larger particles. Still, the small-particle pollution, which the face masks can’t filter, is four times higher here than acceptable levels set by the World Health Organization, Than Nien News recently reported. It presents a huge challenge for Hanoi, one that the government is paying more attention to because of the major threat it poses for public health. Meanwhile, the traffic here continues to increase by 12 to 15 percent each year.